Hyderabad (Telangana) [India], Apr 5 : BSP supremo Mayawati has hit out at the BJP-led central government, accusing it of failure to fulfill BJP's promise in 2014 to bring back black money stashed abroad. "In the previous election, BJP promised to get back black money but no money has come back though it has been in power for the last five years," she said, addressing a rally here on Thursday. 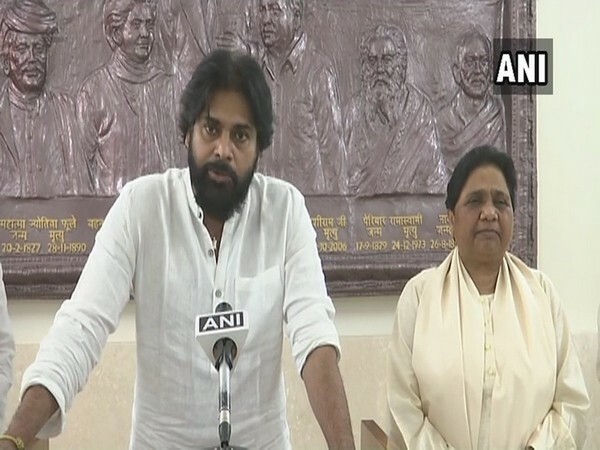 Mayawati shared the stage with Tollywood actor-turned-politician Pawan Kalyan. Bahujan Samaj Party and Kalyan's JanaSena Party have stitched a poll alliance in Telangana and Andhra Pradesh. She claimed that no development took place in Telangana since the state's formation in 2014. "Even after Telangana was formed no development took place. Seventy per cent of the population in the state comprises Scheduled Castes, Scheduled Tribes and Other Backward Class," the BSP chief said. Addressing the gathering, Kalyan targeted Prime Minister Narendra Modi, saying, "Chaiwala has now became chowkidar. Modi is trying to scare the people and that is unacceptable. We should all stand with Mayawati and she should become the Prime Minister." Telangana and Andhra Pradesh will vote for 25 and 17 Lok Sabha seats respectively on April 11. State elections will be also held in Andhra Pradesh simultaneously.